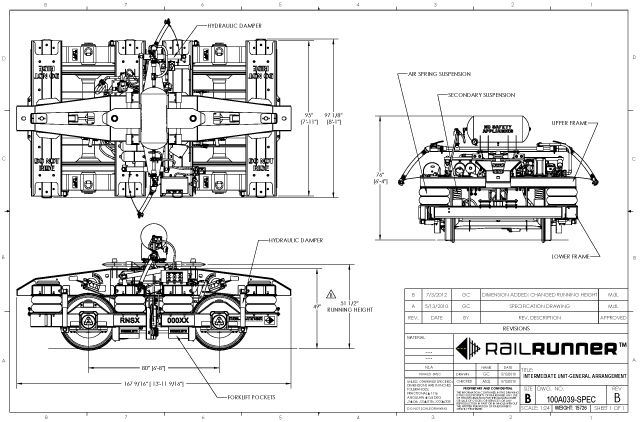 RailRunner®’s Intermediate Unit (IU) is an integral part of the unique bi-modal system. This bogie transforms the RailRunner chassis and/or road vehicle from highway equipment to a high-speed rail vehicle. Rail Car Components: RailRunner bogies are equipped with standard, commercially available railcar equipment including wheels, axles, bearings, and braking systems. Symmetrical, Easy-to-Load Design: Intermediate bogies easily and symmetrically couple with special RailRunner chassis using their patented wedge-shaped, self-guiding design and failsafe-locking pins. Air suspension allows lifting of the road vehicle so that wheels clear the track. Carrying Capacity of Bogie: 95,000 lbs.